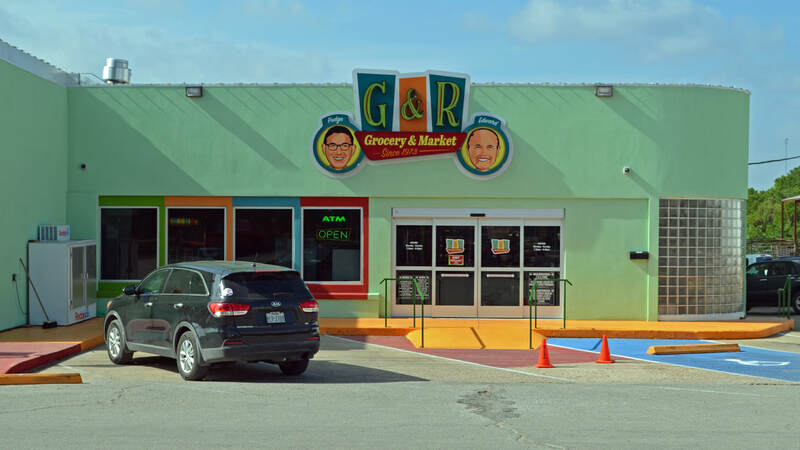 "Early permanent settlers included the Harkey family, who settled at Wallace and Richland creeks in the fall of 1854, and the David Matsler family, who moved from Burnet County and settled on Cherokee Creek that same year. 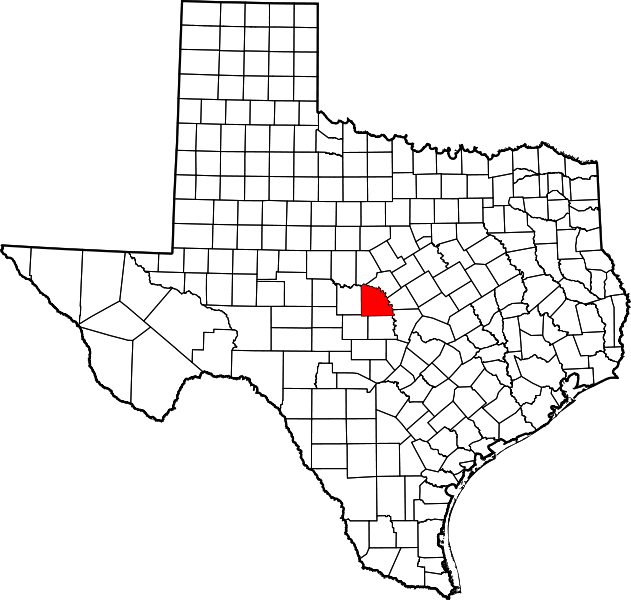 San Saba County was organized in 1856 from Bexar County and was named for the San Saba River. "The act establishing the county was passed by the Sixth Legislature and approved on February 1, 1856. 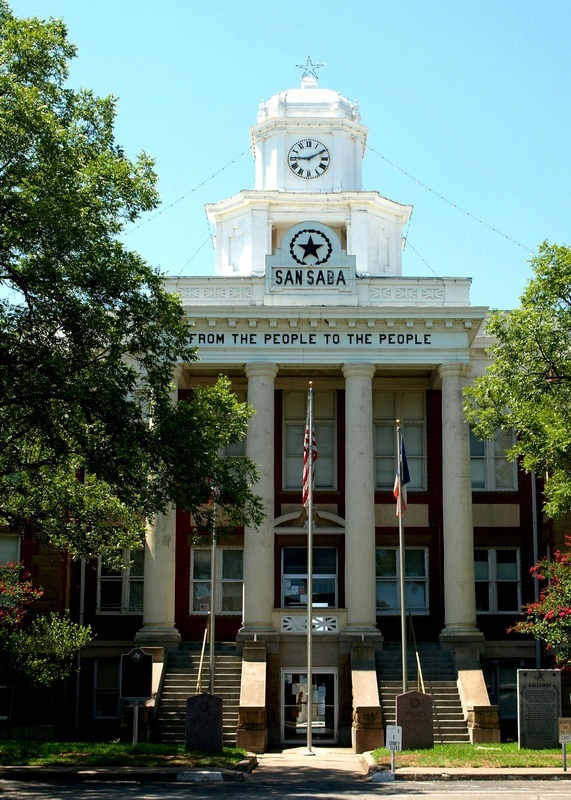 "On July 19  the present site of the town of San Saba was selected for the county seat. 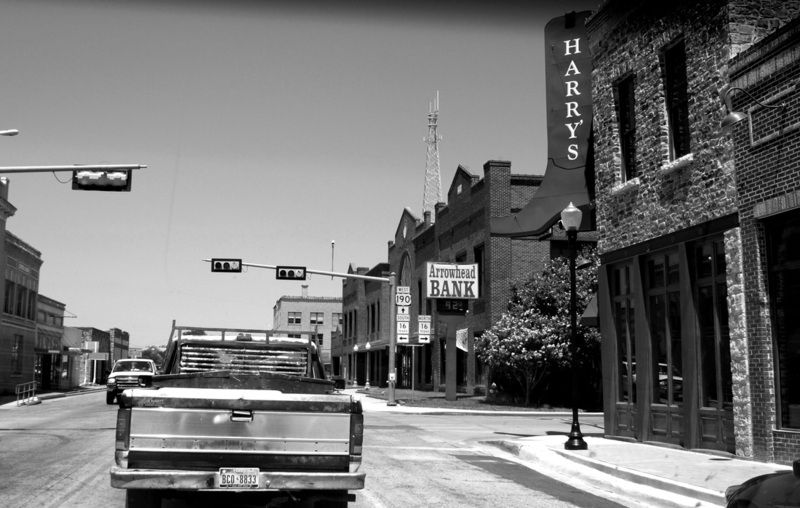 "The original boundaries of the county were confirmed by the Seventh Legislature in 1858. 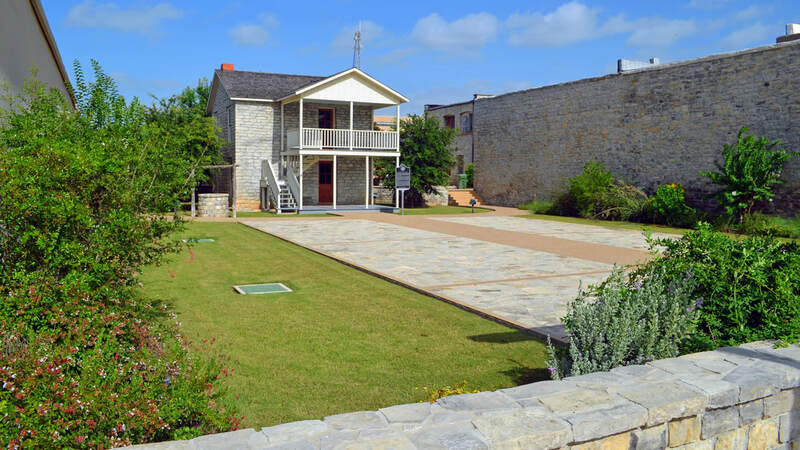 "[San Saba] was the last county in Texas to have its roads paved." 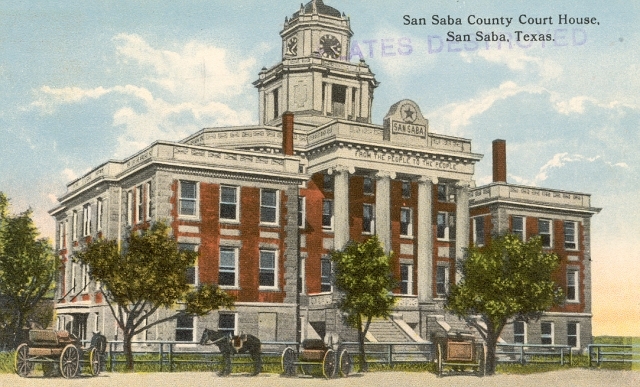 "By 1857 a post office had been opened [in San Saba] and the first county courthouse completed. The court building also served as a school and meetinghouse until it was replaced in the 1880s. 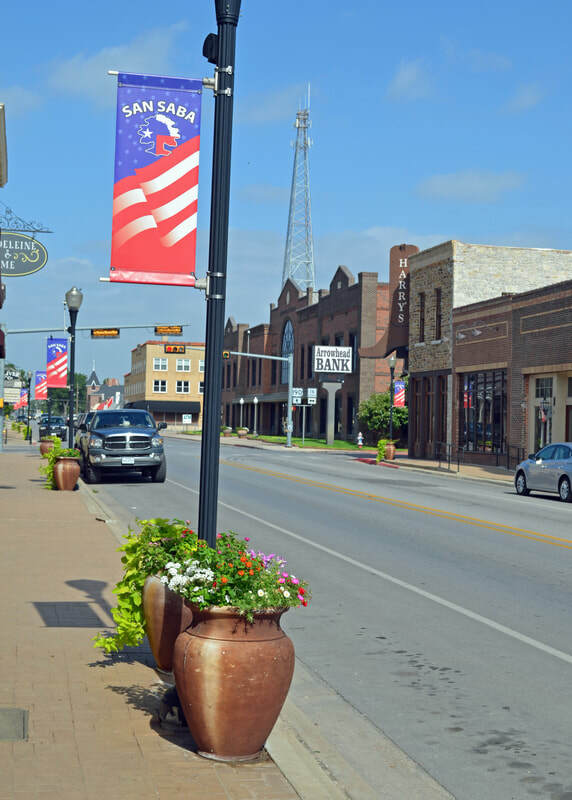 surrounding area, which changed to reflect the post-World War II con-centration on the cultivation of wheat, pecans, peanuts, fruit, and grain sorghum, and on cattle, sheep, and goat ranching. 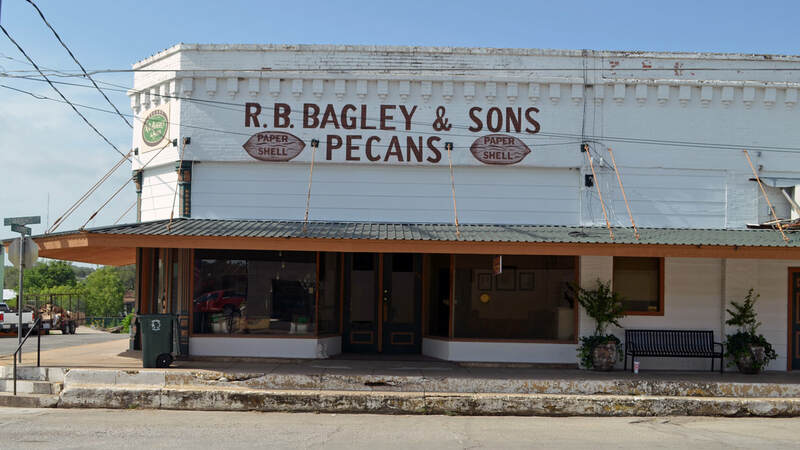 San Saba calls itself the Pecan Capital of the World." 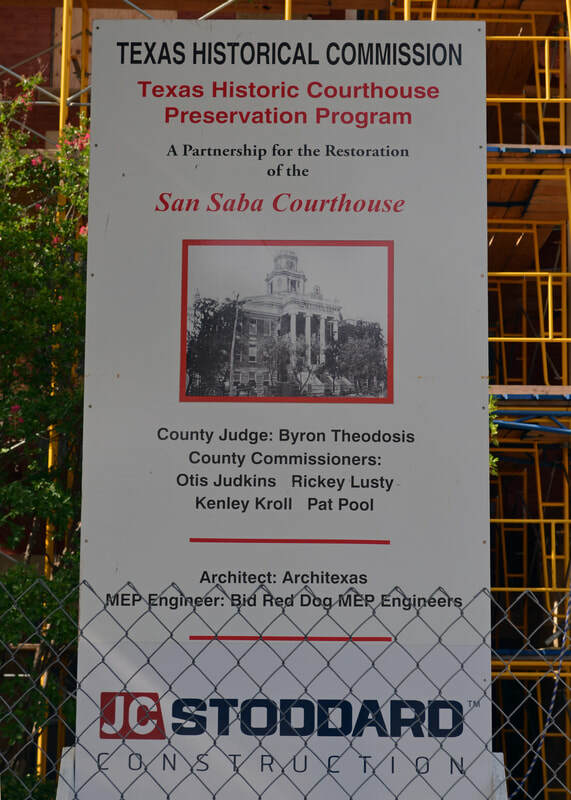 I visited San Saba County and photographed the courthouse in San Saba on June 25, 2011 and June 30, 2018. 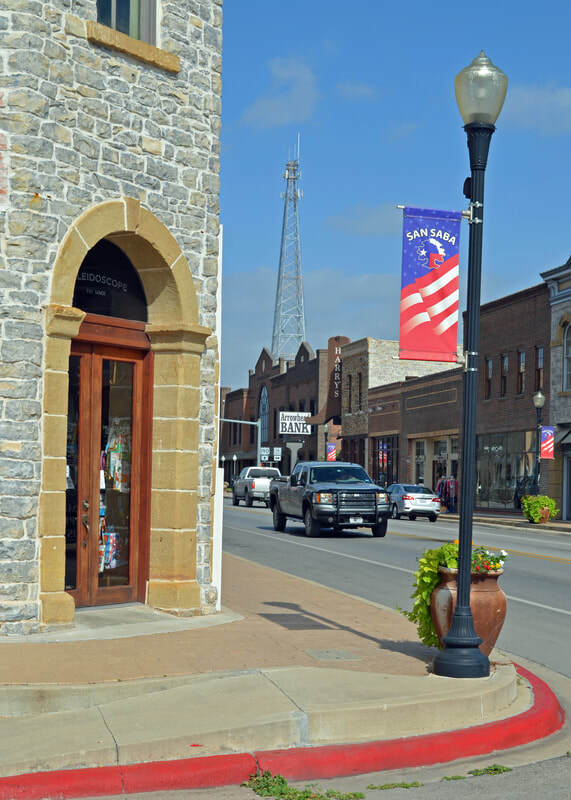 Wallace Street, U.S. Highway 190 in downtown San Saba. 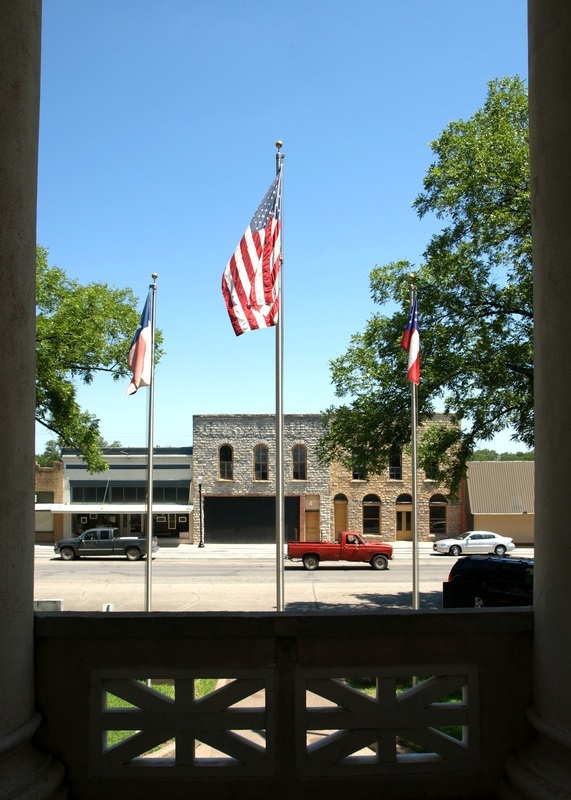 "Several architects and builders responded to the county's solicitation to design the new courthouse, and on June 29 the commissioners looked in detail at two finalists: the firms of Churchill & White of Fort Worth, and Chamberlain and Company of Birmingham, Alabama. ... the court selected Walter Chamberlain's design. 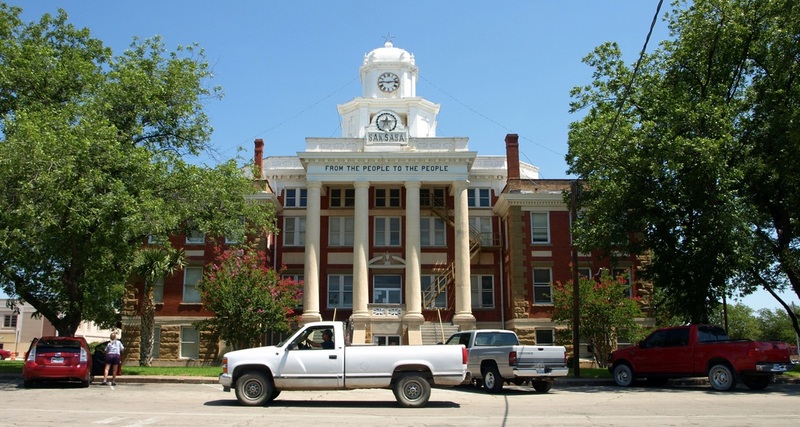 Chamberlain and Company had recently designed the Deaf Smith County courthouse in Hereford in 1910, and the commissioners may have been familiar with that Classical Revival structure. 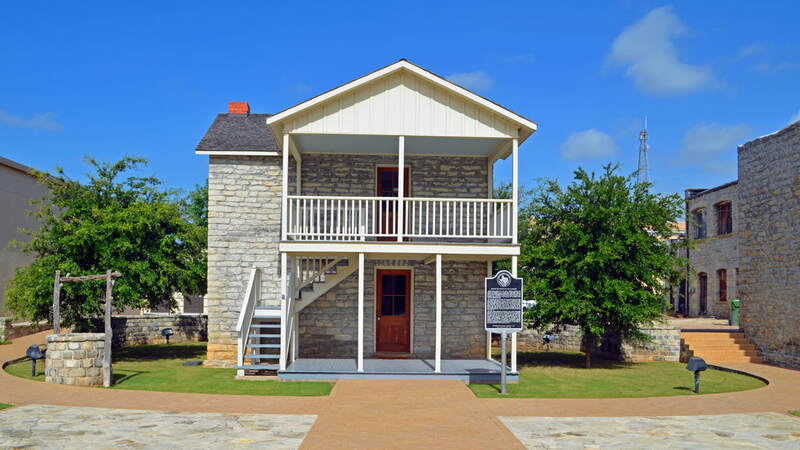 The Round VIII Texas Historic Courthouse Preservation Program grant recipients were announced on April 30, 2014 by the Texas Historical Commission at its quarterly meeting. 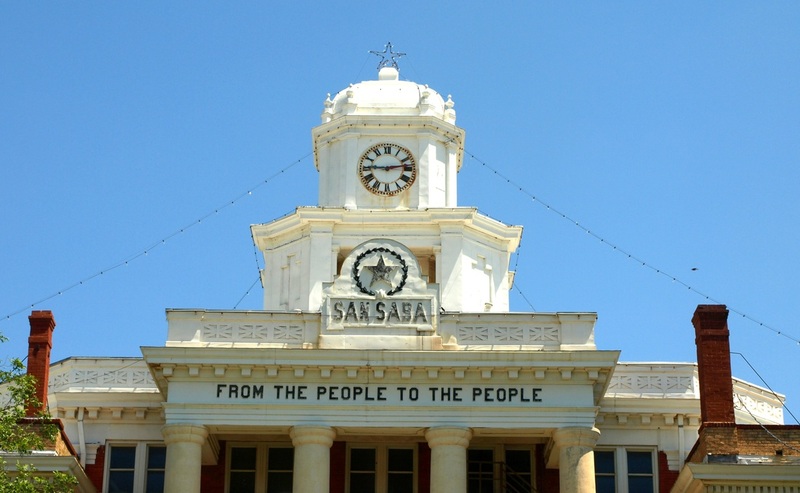 San Saba County: $449,750 grant award for replacement of the original electrical system which is seriously defective. The project also includes stair and sidewalk repairs for pedestrian safety. 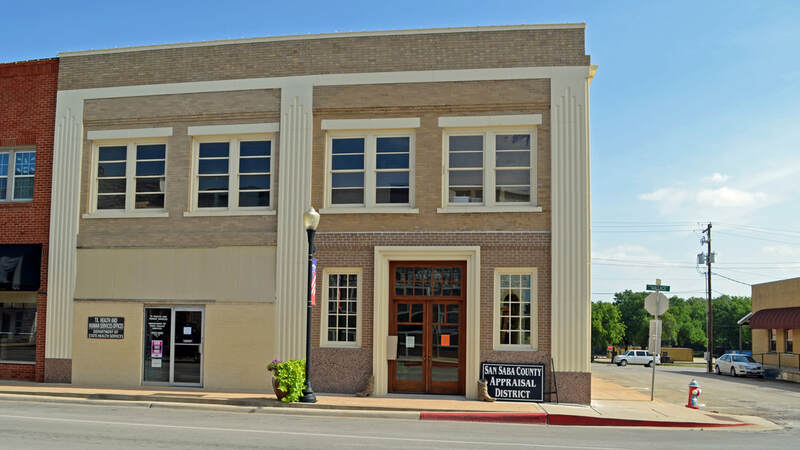 The Round XI Texas Historic Courthouse Preservation Program grant recipients were announced on July 22, 2016 by the Texas Historical Commission at its quarterly meeting. 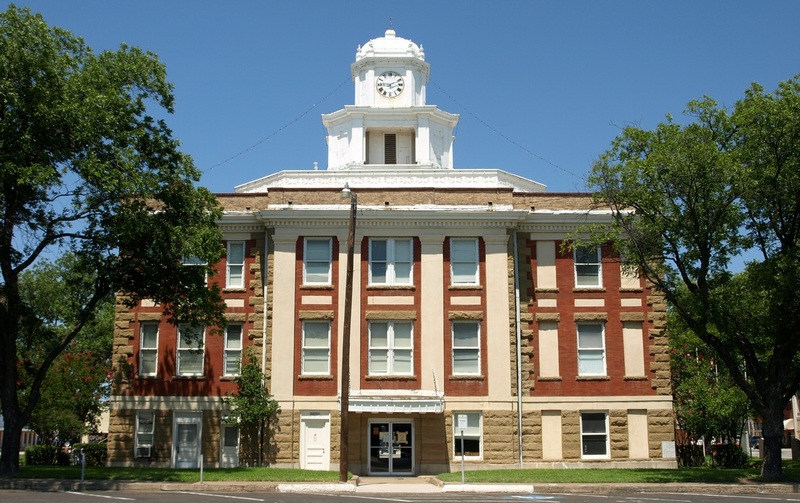 San Saba County--$4,419,995 full restoration grant award for exterior and interior restoration of their 1911 Texas Renaissance courthouse. 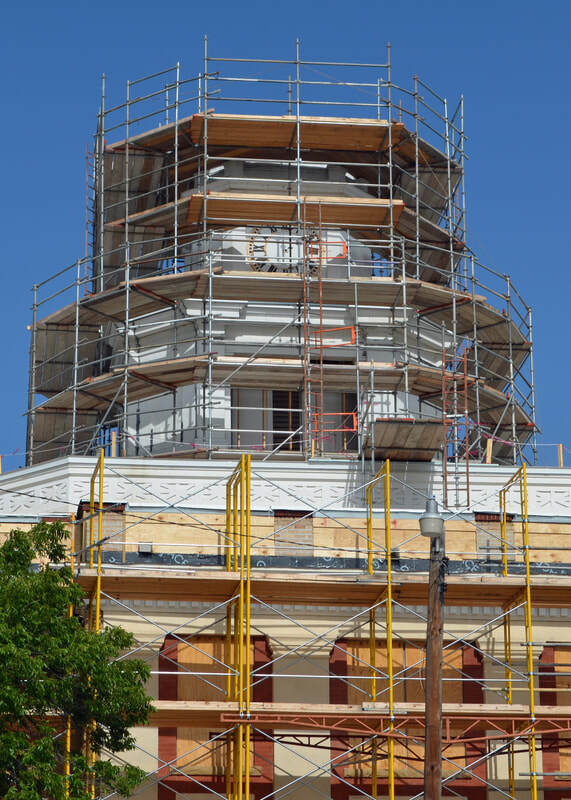 Exterior features to be restored include the column capitals, clock tower elements, roof cornice and parapet entablature, brick and pilaster finishes, and paint. New heating, cooling and ventilation equipment will be installed to provide energy savings and improve comfort levels within the courthouse, and the capacity of the electrical distribution system will be expanded to allow the county to upgrade its security, communications, and data management systems. 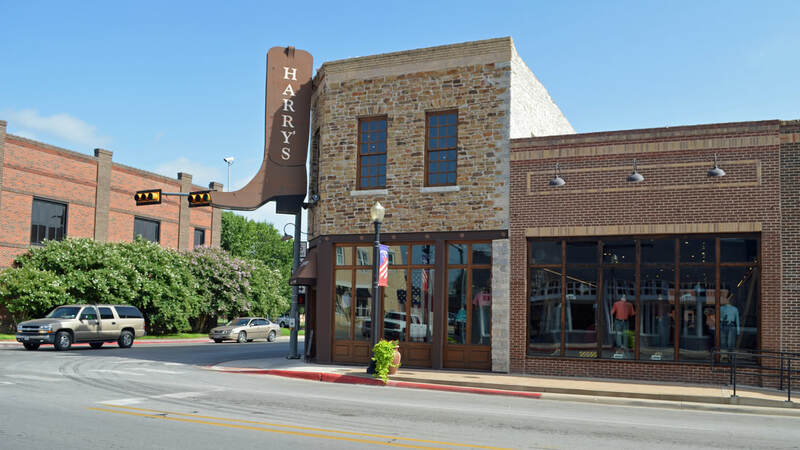 San Saba County submitted approved construction plans & specs for this project with their Round IX grant application, which were produced with a Round V THCPP planning grant in 2008. 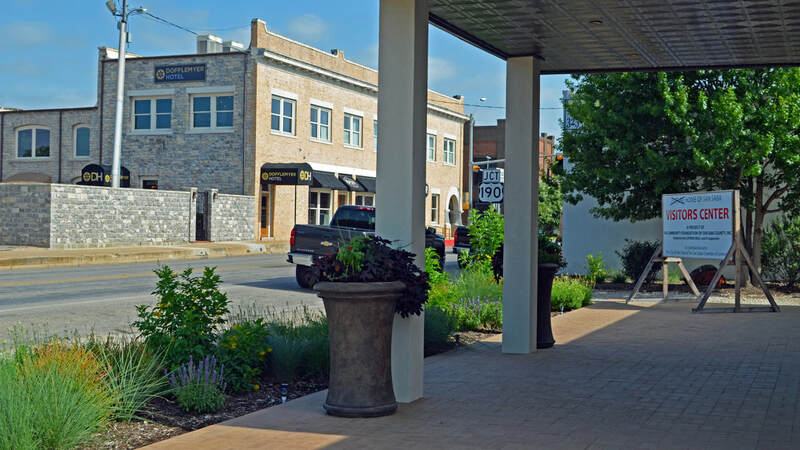 EXCELLENT NEWS FOR COURTHOUSE PRESERVATION!!! The courthouse tower with holiday lights. From the people to the people. The south facade of the courthouse on Commerce Street. The fire escape was a later addition. Monumental stairs on the south facade. 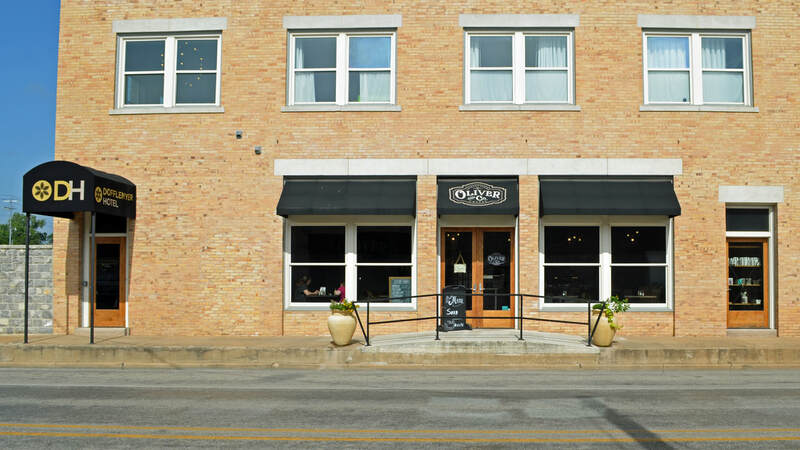 The east facade on Live Oak Street. 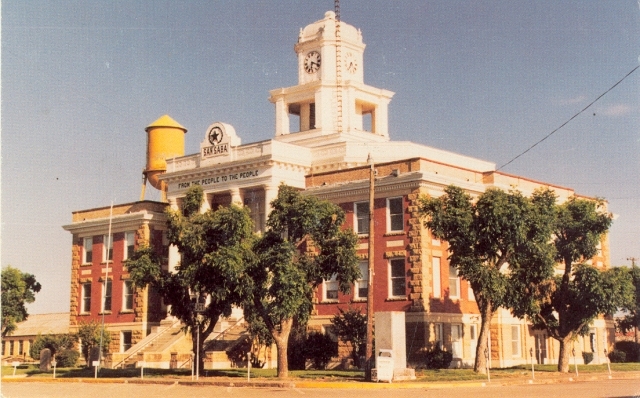 The north facade on Wallace Street is the front of the courthouse. View from the porch on the north facade. The northwest corner of the square. Another courthouse hidden behind a veil of trees. 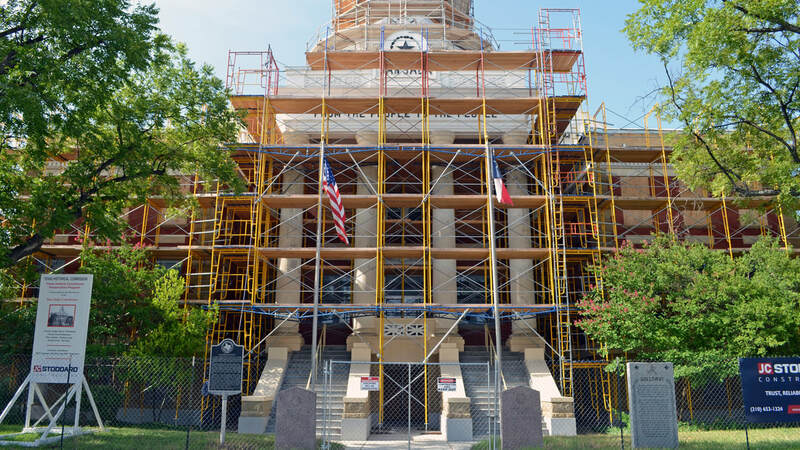 June 30, 2018: the courthouse restoration is underway! 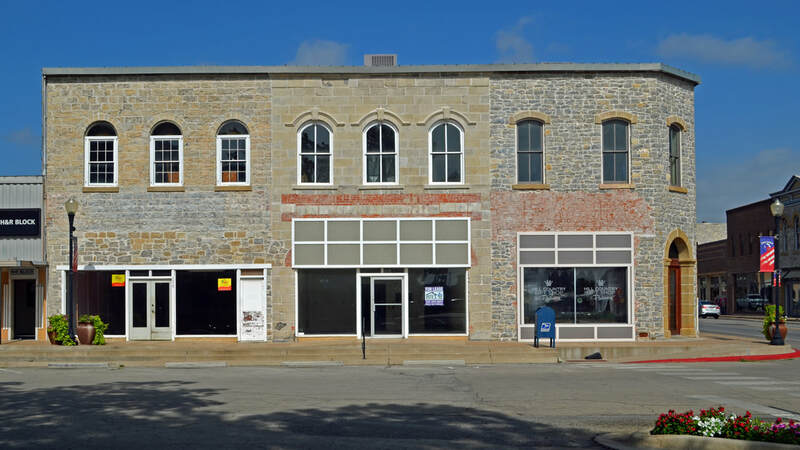 Along with the courthouse restoration, many buildings in the downtown area are being restored and reused. 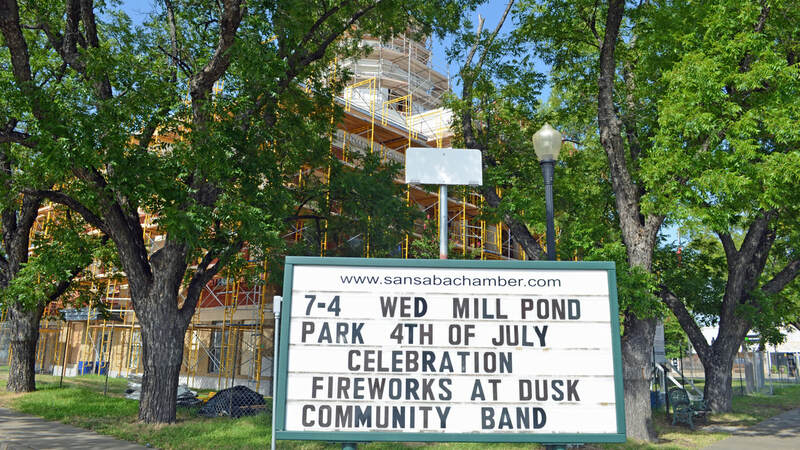 The San Saba Visitors Center is open, too. The Estep-Burleson Building, circa 1870, is on Cherokee Street, on the west side of the courthouse square. The building has been restored to its 1911 appearance, using the earliest photograph of the building.